If you experience chronic or severe jaw pain or a stiff jaw that restricts movement, it could be a sign of temporomandibular joint (TMJ) disorder. Thankfully, you can find treatment to solve the underlying dental problem, relieve symptoms and restore function. Dr. Michael Zhou at Pear Tree Dental Care in Ellicott City, MD can help address the underlying dental causes and provide treatment of TMJ disorder and jaw pain so you can live fully again. The temporomandibular joint (TMJ) works like a hinge connecting your jaw to your skull. It helps control the up and down movement of your jaw so you can chew, drink, talk and yawn. When you experience pain or stiffness in the joint, it is often referred to as TMJ disorder. Medication – Before doing anything invasive, try taking pain relievers or anti-inflammatories. If you need something stronger, your doctor or dentist can prescribe one. Muscle relaxants may also help. Jaw exercises – Slow, gentle exercises and stretching of your upper body and jaw can help loosen your muscles and increase mobility. Physical therapy – Certain exercises can help stretch, loosen and strengthen the jaw muscles. The therapist might also apply moist heat and cold. Moist heat and ice – A moist heat pack or hot water bottle wrapped in a warm, damp towel can be used to relieve pressure and relax the jaw muscle. Using an ice pack for 10-15 minutes at a time will help reduce inflammation. Be sure to wrap the ice pack in a towel so it does not rest directly against your skin. Relaxation techniques – Stress is often a big factor in TMJ disorder. Try doing deep breathing exercises, meditation and other guided imagery techniques or getting a massage to help reduce stress and loosen the muscles throughout your body, including your neck and jaw. Sleep on your side – A different sleeping position can reduce stress on your neck and jaw. Use a pillow to support your neck and shoulders. As we discussed earlier, dental issues often cause TMJ disorder. A dentist can perform an exam and tests to determine the underlying reason for jaw pain and TMJ disorder. Problems with the jaw due to missing teeth might be addressed with dental crowns, bridges or dentures. Orthodontic treatment with braces or Invisalign® can help straighten crooked teeth and fix alignment problems. If you have experienced jaw deterioration, there are certain surgical treatments and bone grafts that can strengthen the jawbone. You might also need a specialized bite guard to keep you from grinding your teeth at night. 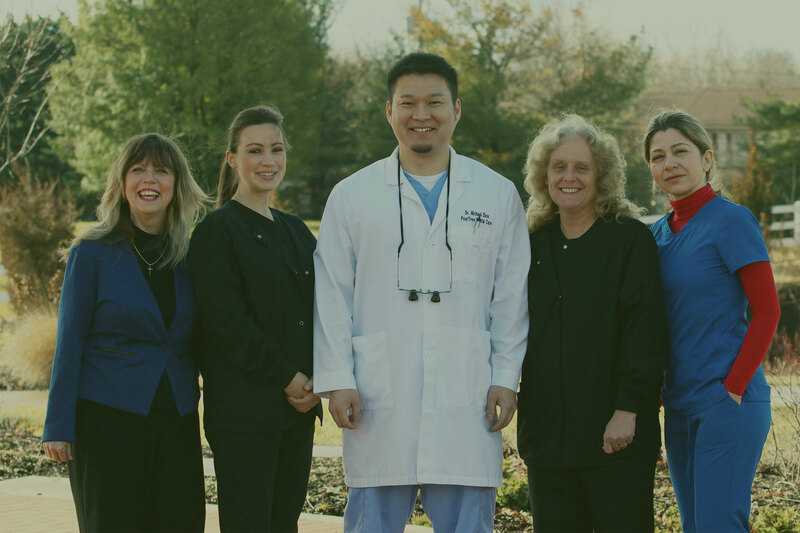 If you have jaw pain or TMJ disorder, Dr. Michael Zhou and his team at Pear Tree Dental Care in Ellicott City, MD offer expert care to restore jaw function and get you back to a normal life. Contact us at (410) 750-2599 to make an appointment.